With fall fast approaching, the food gets a little heartier. These cheesy, garlicky, buttery biscuits are just the thing to compliment a big bowl of soup or stew, fried chicken and cream gravy, or even a weekend breakfast. Preheat oven to 425 degrees. Swirl 1 tablespoon of butter into iron skillet (10" to 12") to coat the bottom and set aside. In a medium mixing bowl, whisk baking mix, 1/2 teaspoon garlic powder, and parsley until well-combined. Add milk and cheese and stir just until combined. Dough will be wet. Place dough on a lightly floured surface, and sprinkle top lightly with flour. With floured hands, lightly pat dough out a little, then fold it in half, and gently pat into a rectangle. Fold again, dusting with a little flour as needed to keep dough from sticking. Handle dough as little as possible. Gently pat dough out to about 3/4 inch thick. Using a biscuit cutter or a cookie cutter, cut straight down (do not twist cutter). Place biscuits in skillet, sides touching, and bake until golden brown, about 10 minutes. While biscuits bake, whisk remaining 1/4 teaspoon garlic powder into remaining 3 tablespoons melted butter. When biscuits are done, brush tops generously with garlic butter. Serve warm. Notes: Pre-shredded cheese doesn't always melt very well because it is coated with an additive that keeps it from clumping. These biscuits will be a little more tender and the cheese will melt a little better if you shred your own. 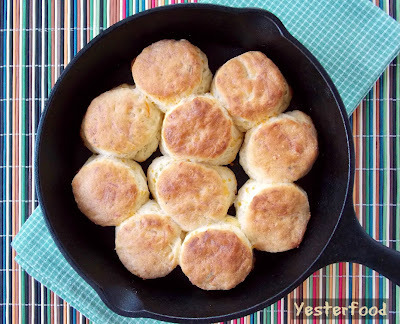 Cheesy Garlic Biscuits have been shared at these great parties! If it weren't so late, I would love to make some of these right now! I am sure I will be having good dreams tonight! Sounds great! Perfect for those cold mornings! Yuuuum. I can never resist those little bags of bisquick mix for drop biscuits. Now I can make my own! Oh my, biscuits have just risen to a whole new level - I'm never gonna lose any weight.... or maybe I'll just make them and send the rest over to my in-laws... I don't think I can resist this recipe! 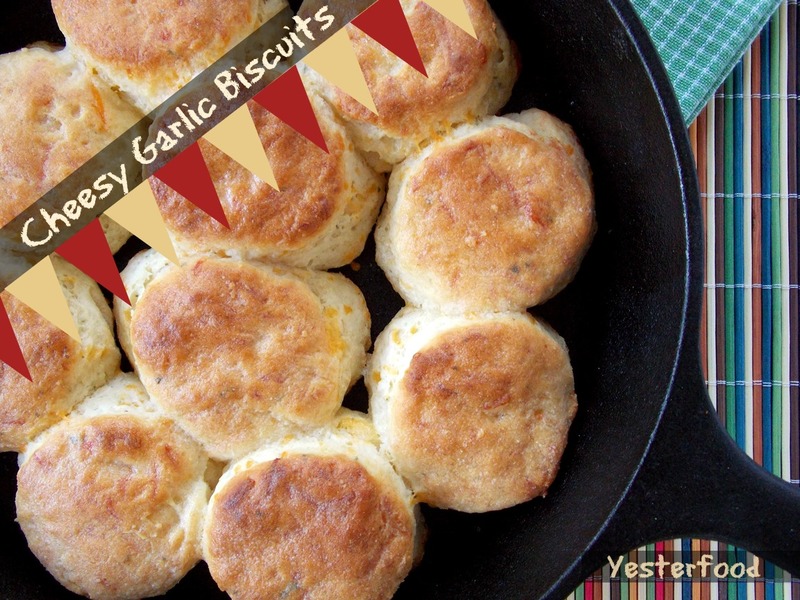 I love biscuits and these do sound yummerific - garlic and cheese! mmmmmmmmmm Thank you for sharing! And now I want soup for lunch! Yum! These look really good!! I think I will try them the next time I make soup for dinner! I do these in a cast iron skillet as well. LOVE the way it bakes them up. Thanks for stopping by and linking up. WOW!! and yum! Those look so wonderful. Thanks for sharing. Those biscuits look like they are ready to set on the table and pass the biscuits please! Have a great week, I'll be having some of those biscuits, thanks for sharing! Thank you, Miz Helen, I'd love to share a pan of these biscuits with you! :) Hope you have a great week, too! Stopping by from the Sweet Tea Social - really should not have done that around dinner time. These look sooooo good. I must try. You had me at cheese and garlic....yum!! O'Charleys at home. You had me at warm. It is getting chilly in Ky. having soup and these will be great with that. Thank you so much, April- I do love to bake in a cast iron skillet! :) Thanks for coming by! So to me, biscuits deserve their own food group, and these look heavenly! YUM! I can't believe I made biscuits that tasted so good! I baked them in a cast iron pan for 12 minutes and had them with sweet and sour pot roast. Yum! Thanks for such a delicious and easy recipe. Definitely will make again many more times! It was 96 degrees here today, but I don't care. 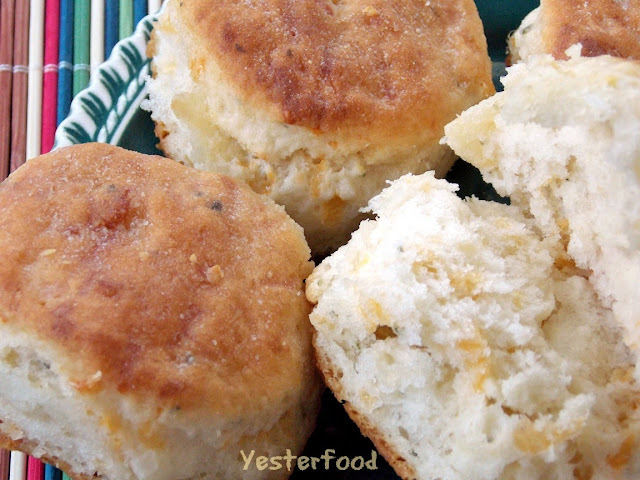 Your pictures make me want a bowl of something hot...hmmm...maybe chili...with lots of these biscuits. Thank you for linking, Joy. And thank you so much for all the shout-outs on G+. These would be great in a dutch oven while camping!! I hadn't thought about it, but I think you're absolutely right, Diana! I would love to have these while camping! :) Thank you for the visit and for the suggestion! Wow, those look amazing... and I love that they're done in a skillet! Thanks, Jenn! I'm kind of addicted to the great crust they get in an iron skillet, while remaining all soft and tender on the inside! :) Thank you for stopping by! Joy, these Cheesy Garlic Biscuits look amazing!!! Thanks for linking them up to my Sweet Wednesday Link Party! Joy, thanks for linking to What'd. You Do This Weekend? My son worked at Red Lobster and made hundreds of these. He would bring home leftovers. They were never as good as fresh. Linda, thank you so much for hosting What's You Do This Weekend? It's always a great party! :) Thanks for coming by! So glad that you brought this awesome skillet of biscuits to share with us today. Thank you so much for sharing with Full Plate Thursday and have a great week! Oh my goodness. These look so heavenly. I will also have to check out the garlic potato soup as well :) They look like a perfect match! 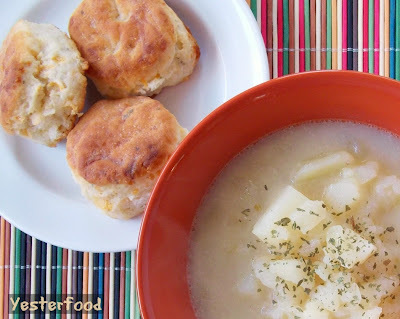 Kelly, thank you so much- the biscuits are delicious with the potato soup....and they would be great with your beautiful Italian Chicken Roast as well! ;) Thank you for visiting! These look so yummy!! Thank you for sharing on Thrifty Thursday, I have Featured your post this week! I hop you will join us again! Joy, They look delicious and I love the recipe. They are definitely going on my To make list!